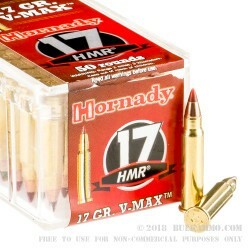 This 17 HMR (“Hornady Magnum Rimfire”) cartridge combines several attributes which make it an ideal load for hunting varmint and small game. 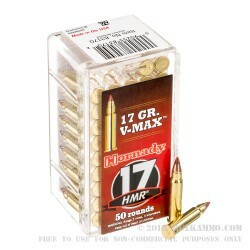 It has a 17 grain V-MAX bullet, which quickly fragments upon impact, leading to efficient and humane hunts. Plus, the bullet’s polymer tip and aerodynamic design guarantees an accurate and flat trajectory. Made by hunters for hunters, this ammunition stands up to Hornady’s reputation for craftsmanship. It is an accurate, reliable cartridge, whether you are taking squirrels and rabbits in the woods, or coyotes and bobcats in the desert. Received product very fast, package. Was very neatly packed. Q: is polymer just plastic? and what does it do? A: Yes, the polymer tip is essentially plastic. 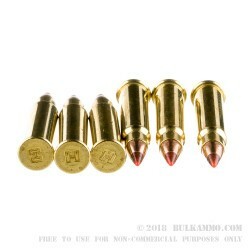 It helps increase the ballistic coefficient of the projectile, allowing the bullet to fly farther, faster and flatter. It also helps start expansion once the bullet hits its target. 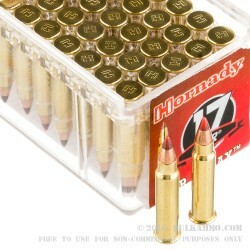 Q: With the growing popularity in the .17 caliber shooting, will it be offered in larger quantity boxes in the future? A: Consumer demand drives packaging and bulk sale considerations, and we are currently unaware of bulk-pack .17 HMR.